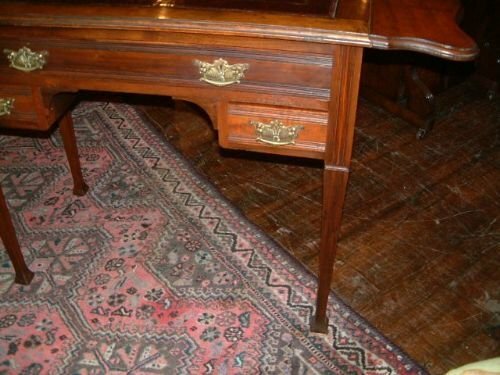 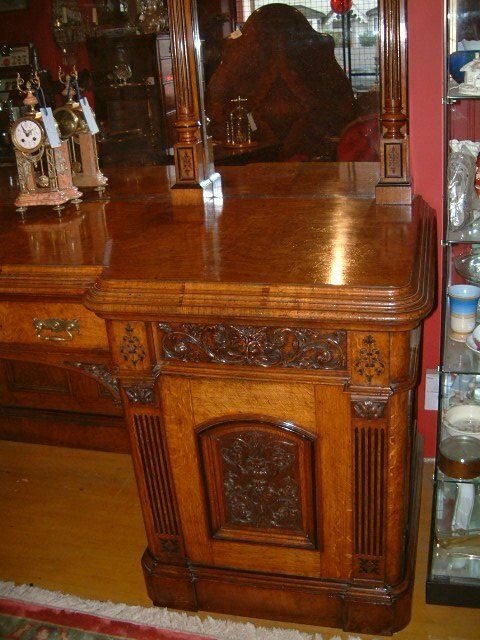 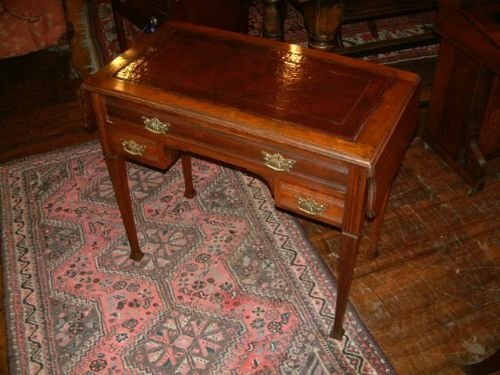 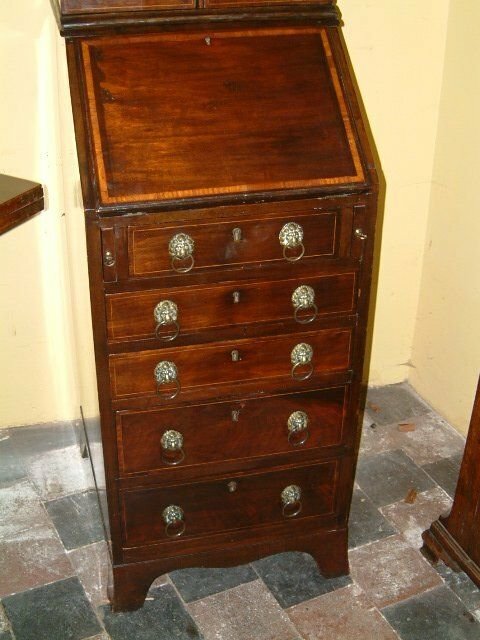 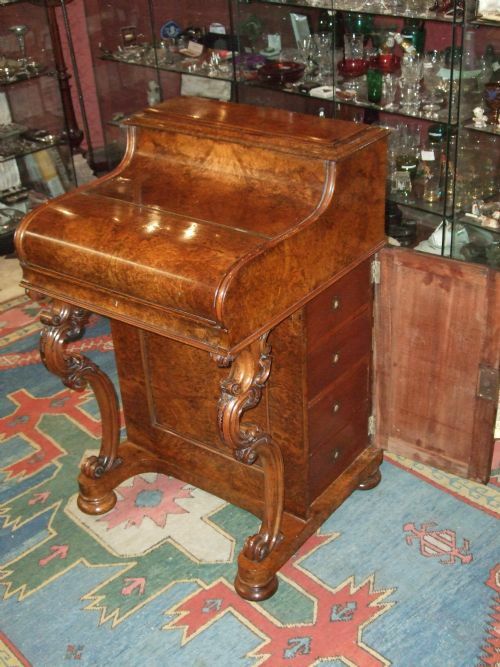 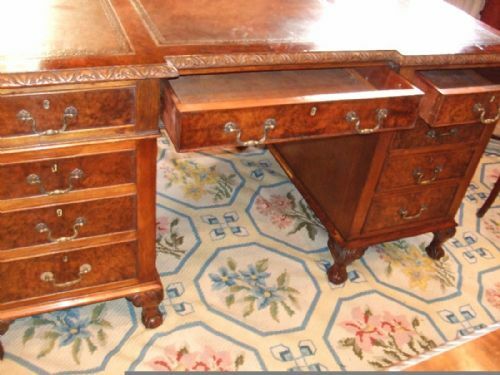 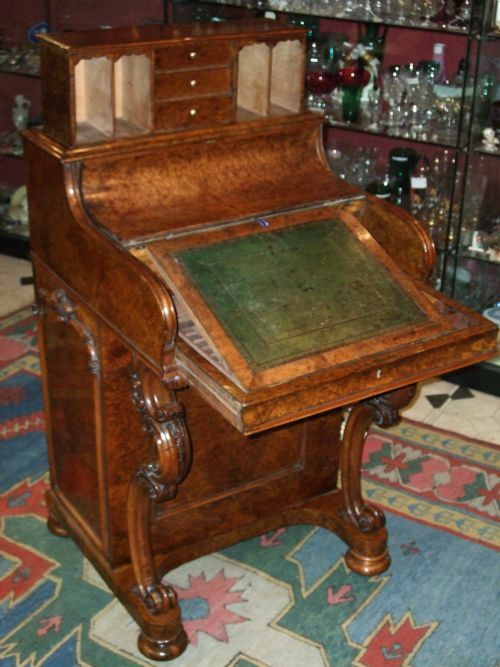 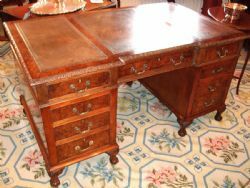 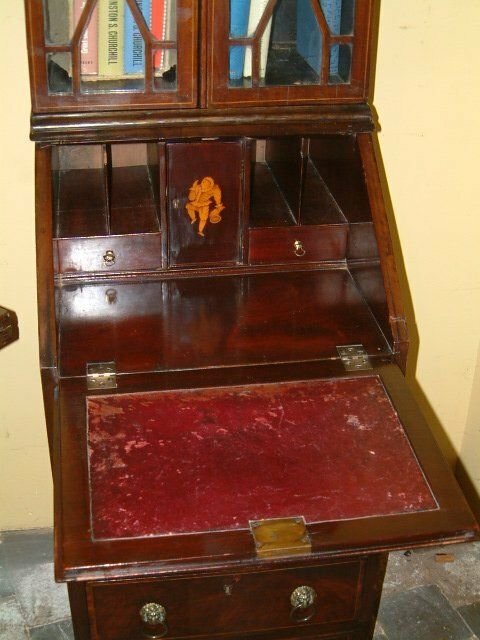 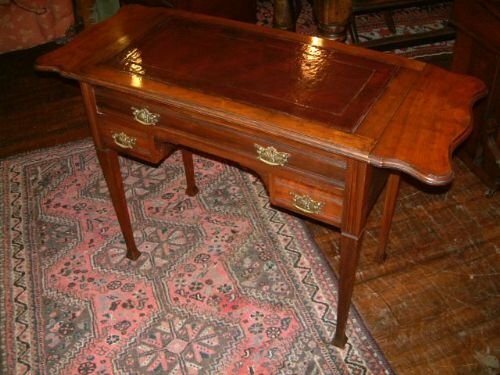 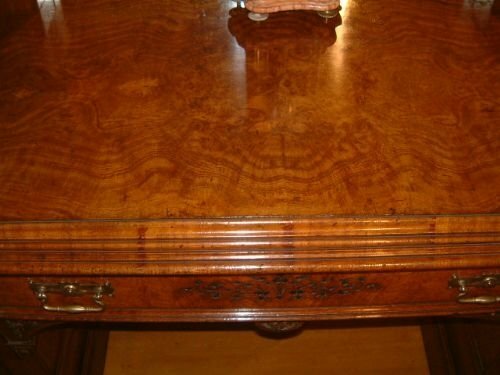 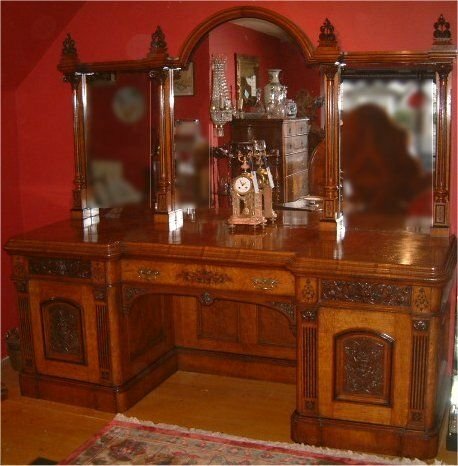 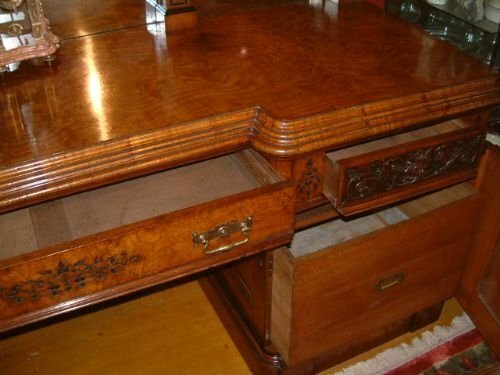 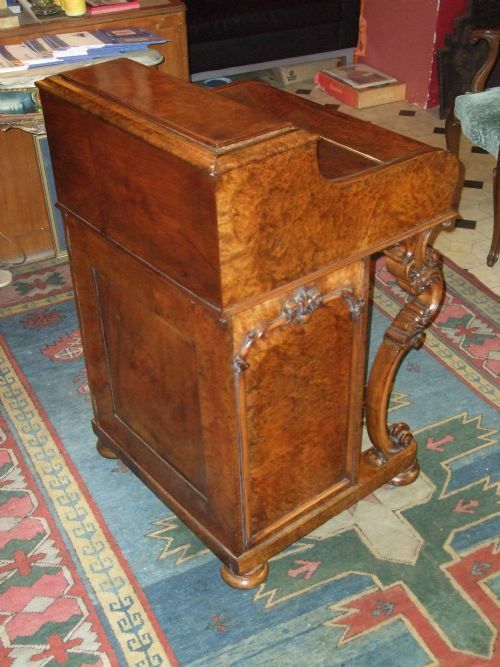 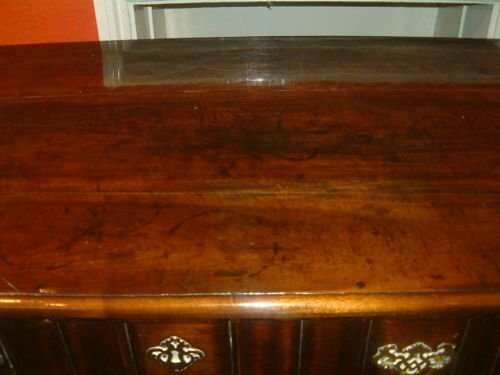 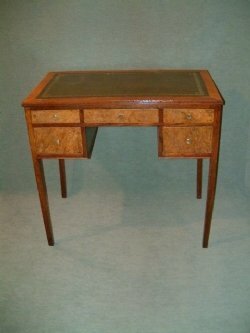 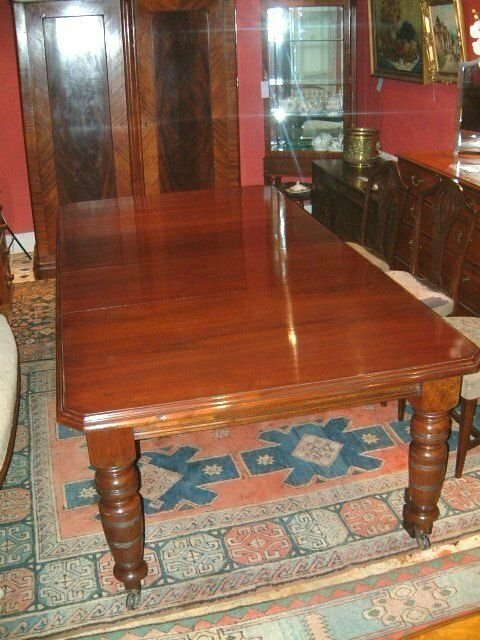 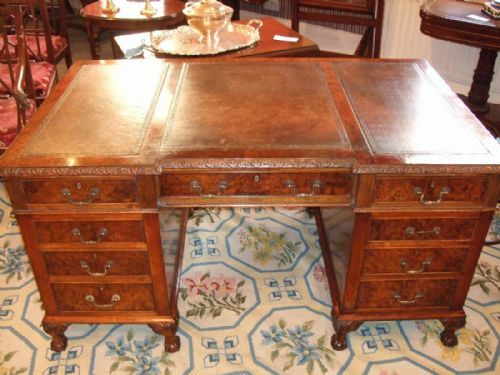 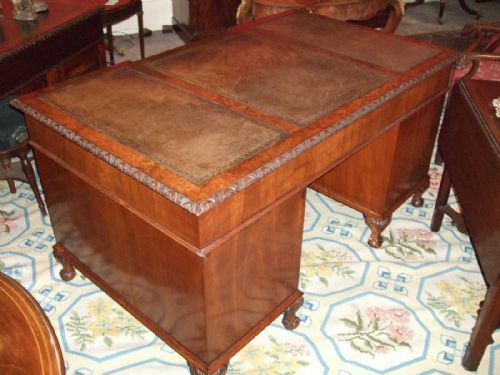 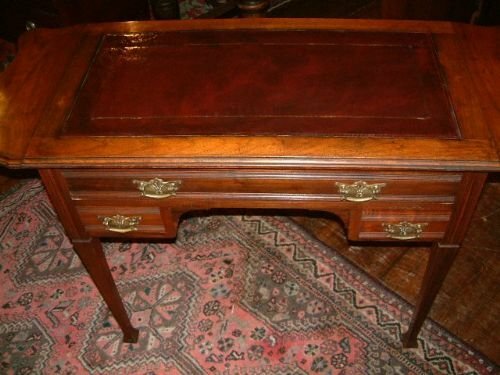 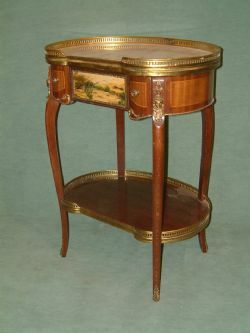 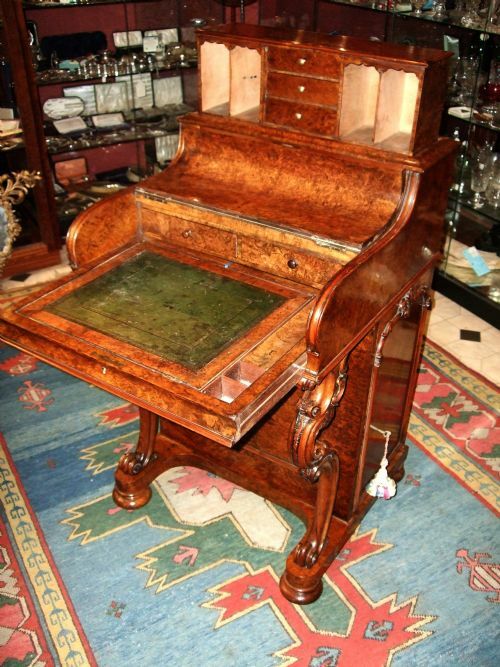 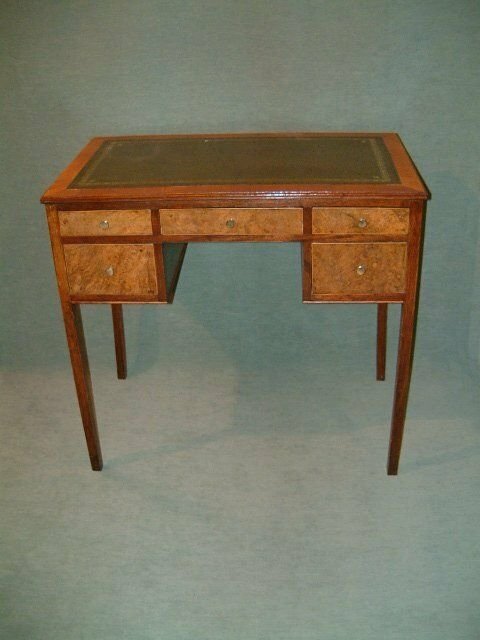 Edwardian Walnut & Burr Mulberry Writing Table. 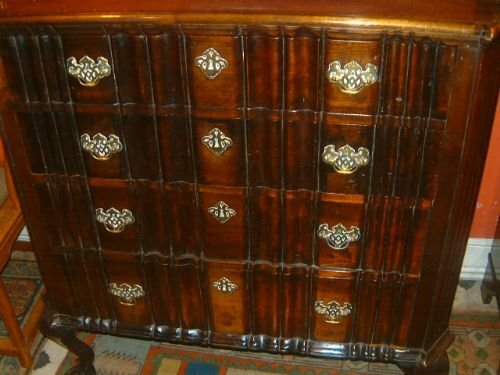 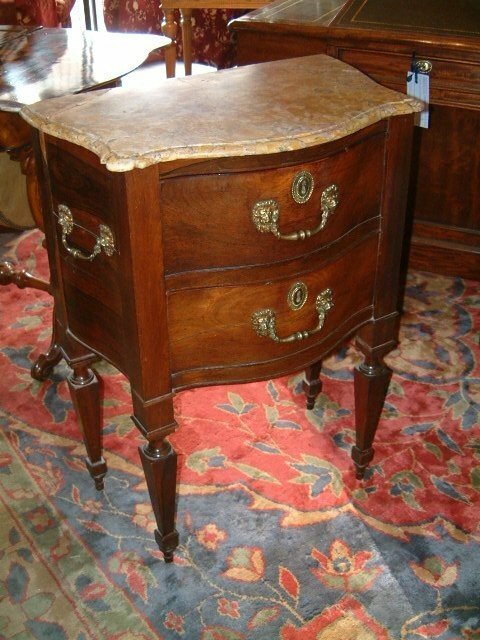 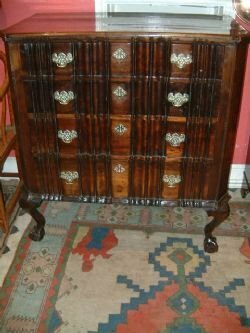 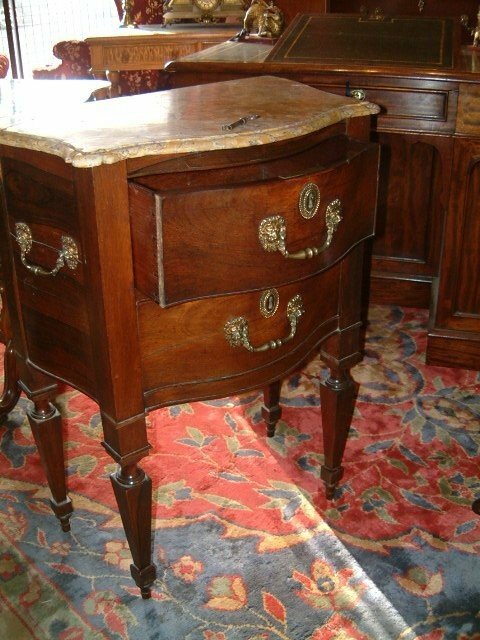 Charming Table with Unusual Burr Mulberry Veneers, the Leathered Writing Area above 5 Drawers with Brass Knobs. 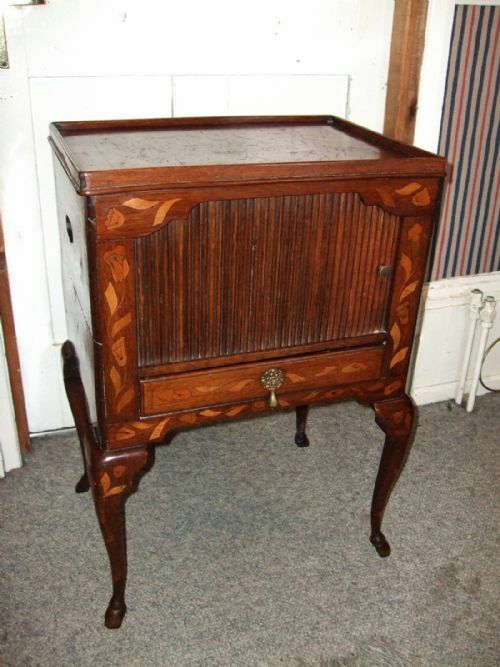 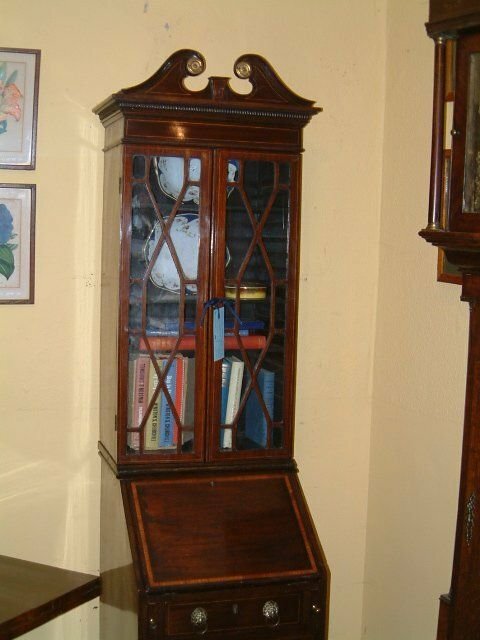 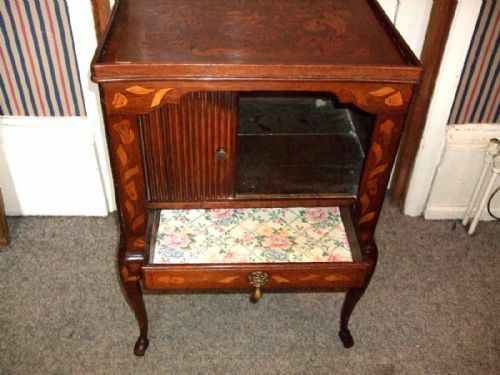 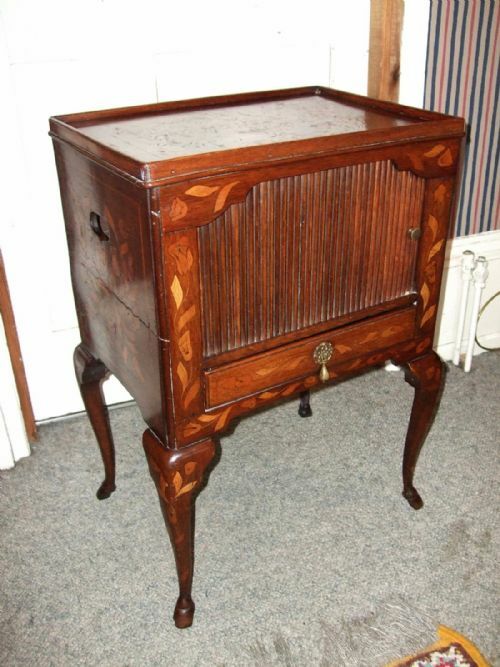 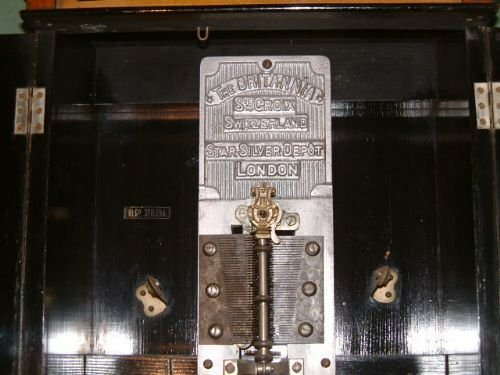 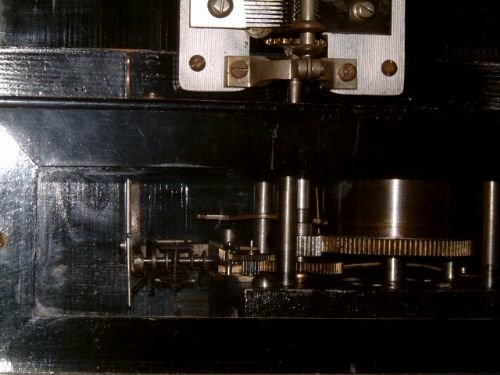 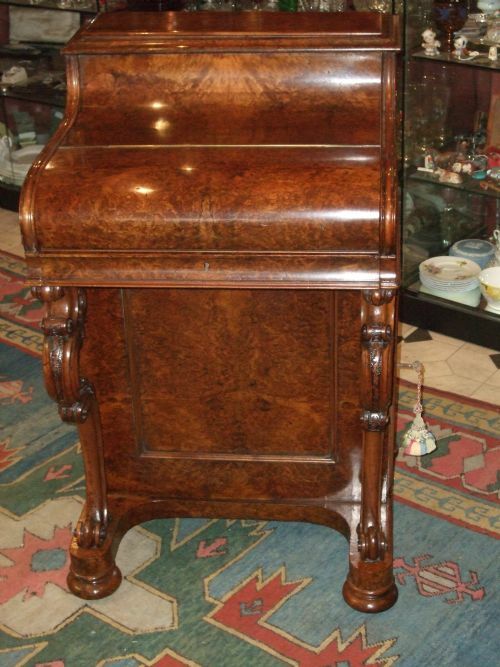 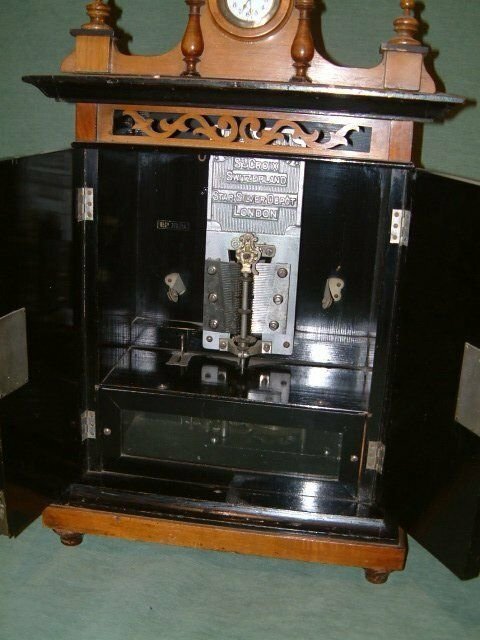 Edwardian Walnut Britania 9" Disc Music Box with Transfer Door Panels. 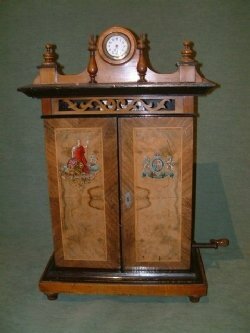 Edwardian Walnut Britania 9" Disc Music Box with Transfer Door Panels. 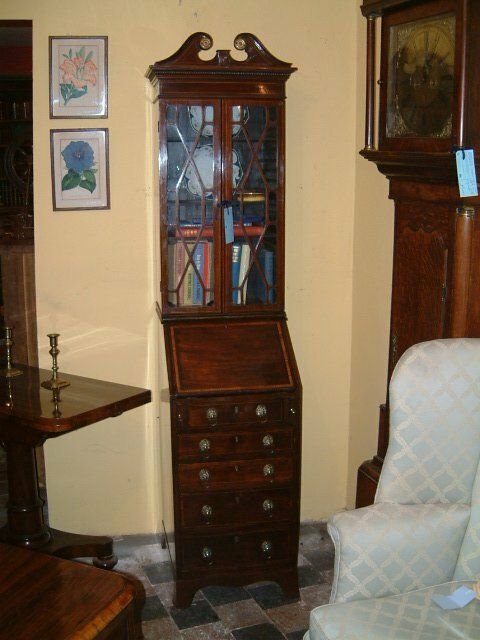 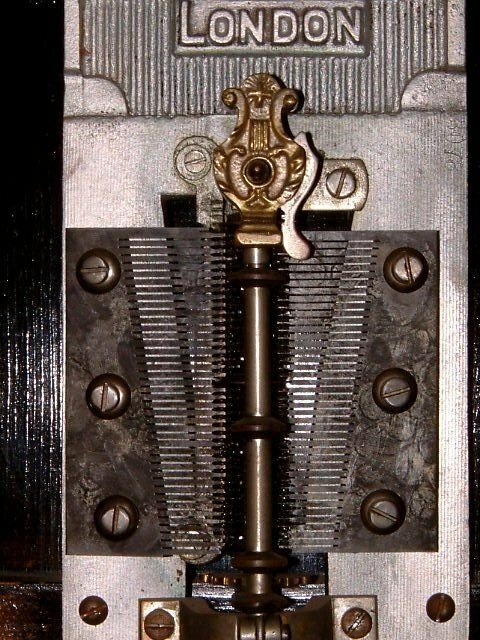 Known as the Smokers Cabinet with Clock and Crossbanded Dooor Panels restores Movement works plays perfectly all teeth sound. 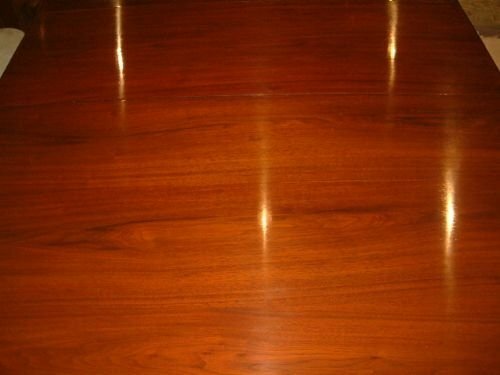 with at least 1 disc, beautiful tone. 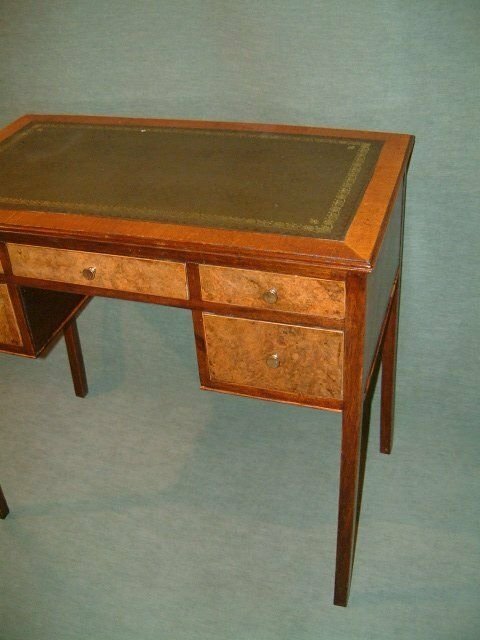 Edwardian Walnut Drop Flap Writing Table with Brass Handles & Gold Tooled Leather Writing Top. 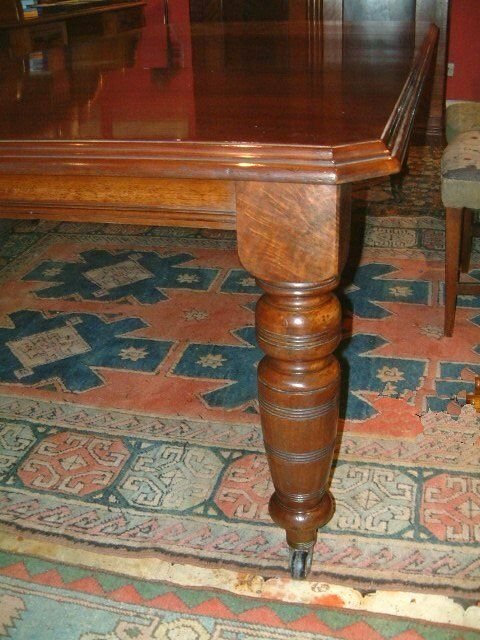 Good Figuring & Colour . 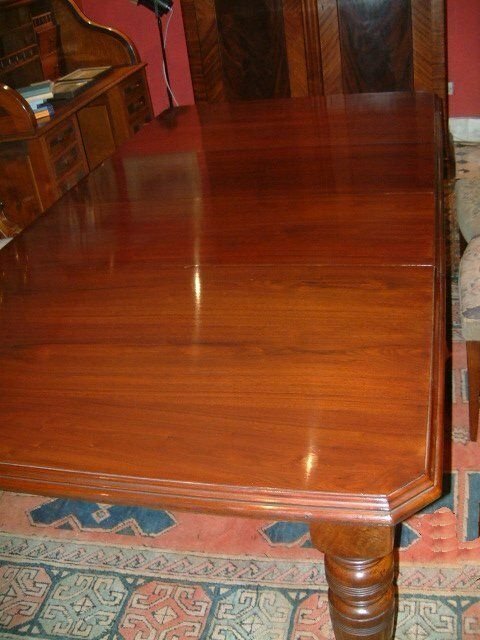 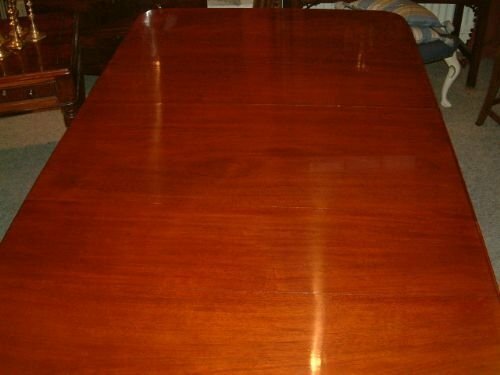 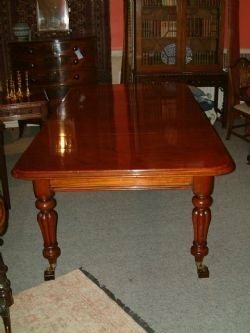 Edwardian Wind Out Mahogany Dining Table with the Original Leaves Suppported on Ring Turned Legs with Brass & China Casters, Excellent Colour & Figuring. 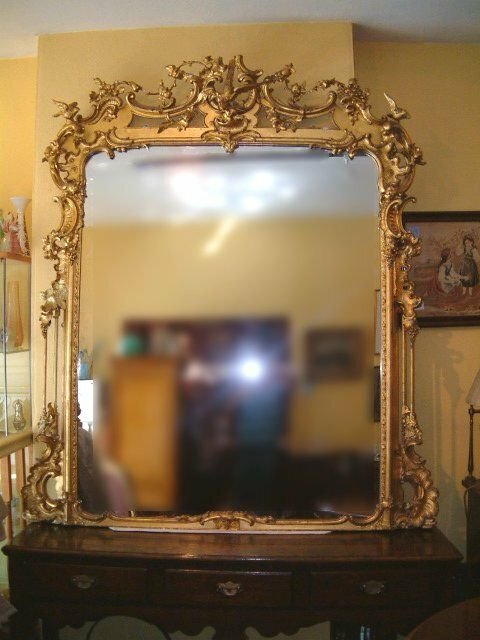 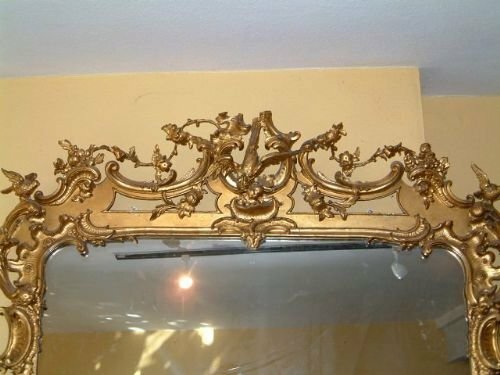 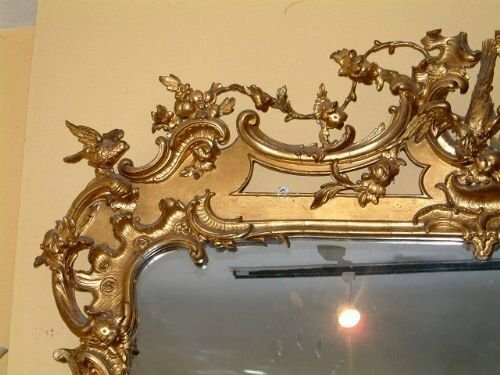 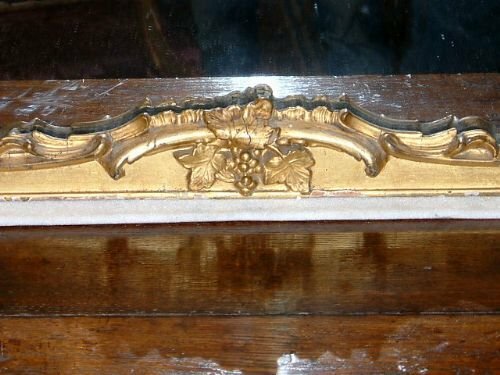 Fantastic Victorian Chippendale Rococo Gilt Mirror with Birds and Folliage Swags Grapes etc. One of the best we have seen for a long time. 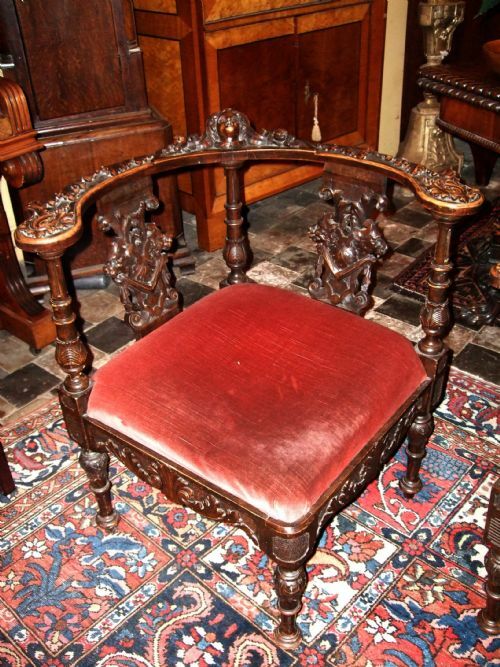 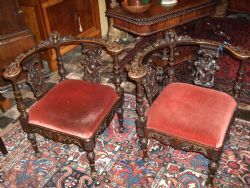 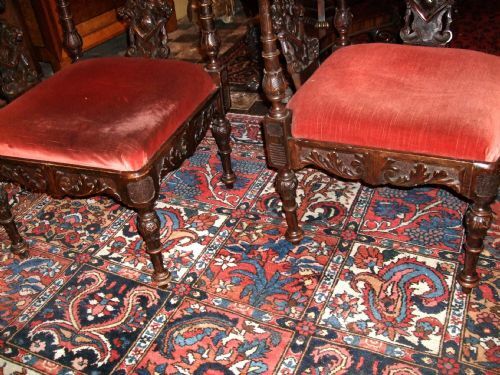 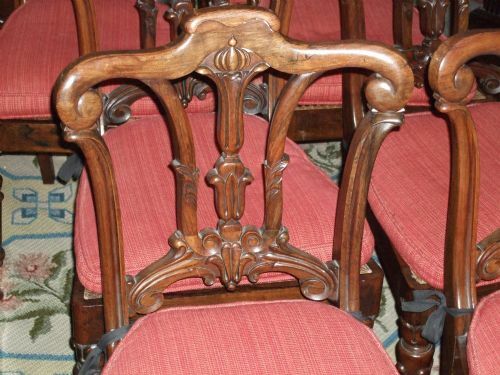 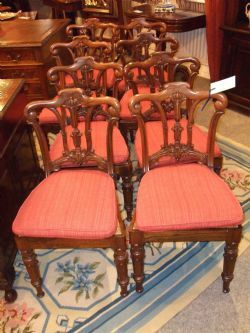 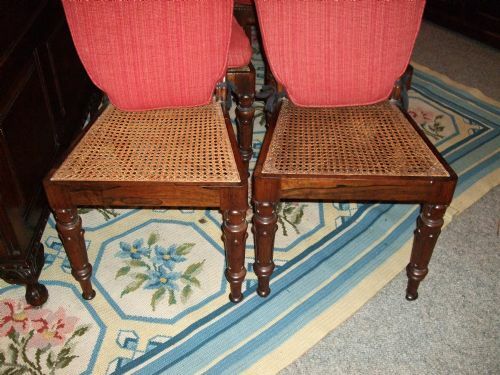 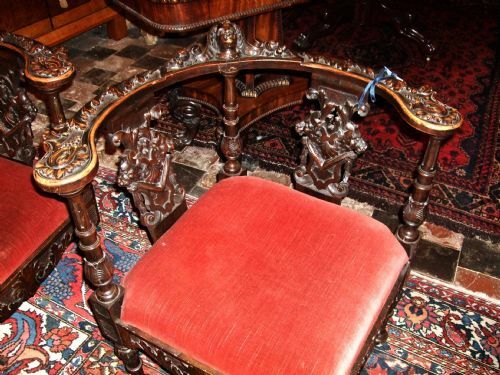 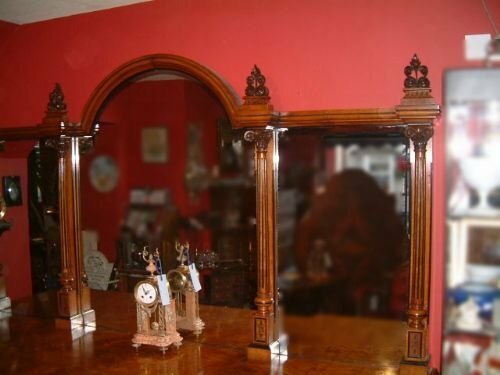 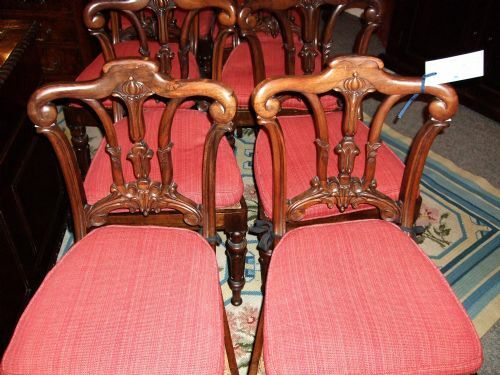 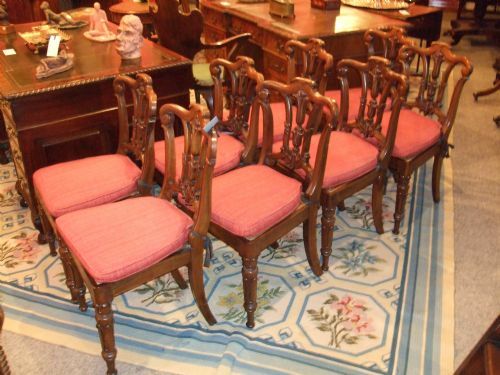 Fine Pair of 19thC Italian Carved Walnut Renaissance Style Corner chairs, Superbly Carved. 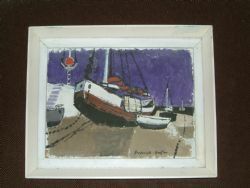 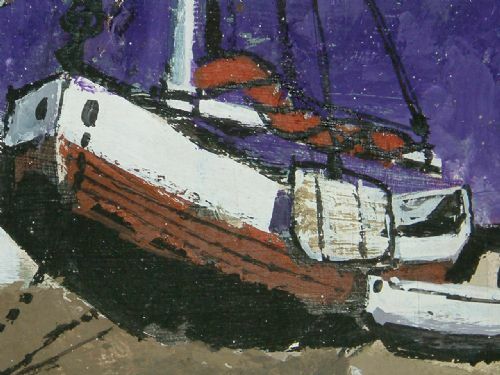 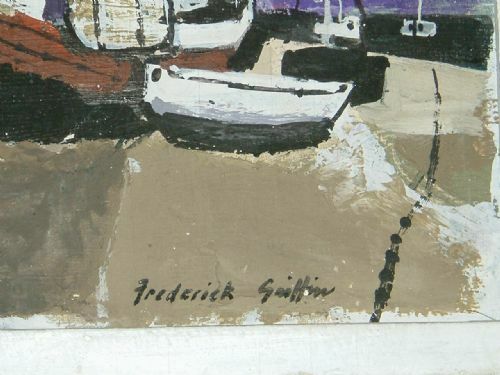 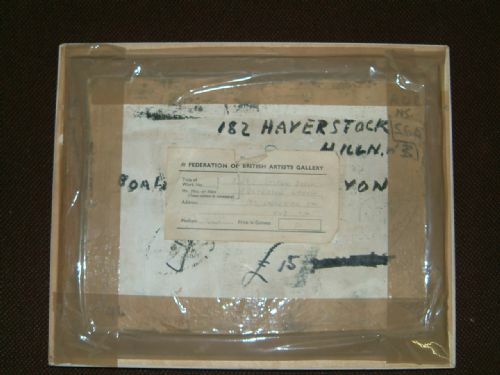 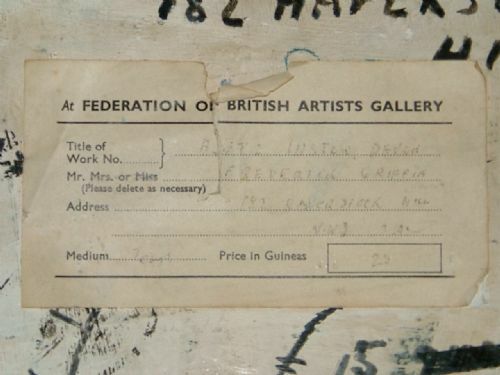 Superb Colour & Patination & Condition. 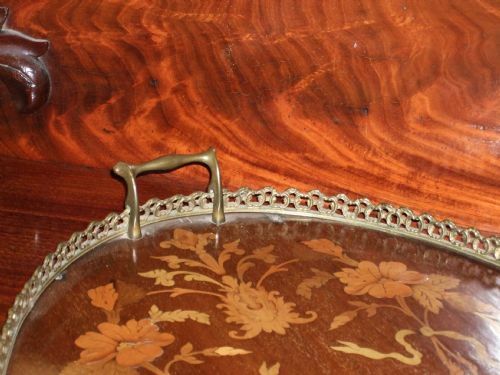 Finely Inlaid Edwardian Oval Tea Tray with Brass Gallery & Handles. 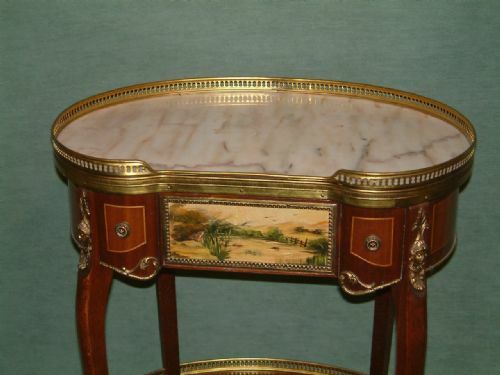 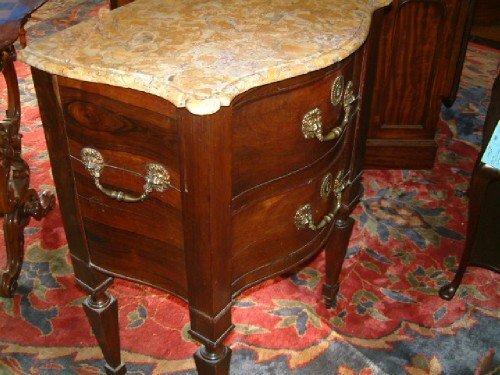 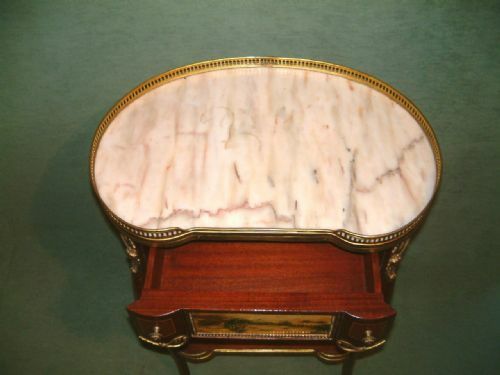 French Marble Top Rosewood Bedside Chest with Superb Original Ormolu Handles & Escutcheons with Original Key. 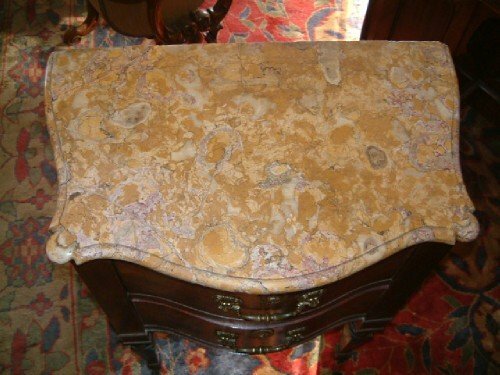 The Marble top with Restorations. 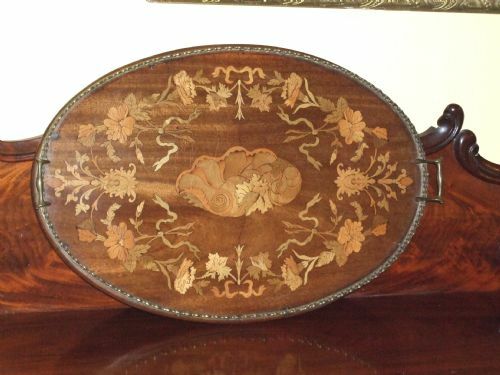 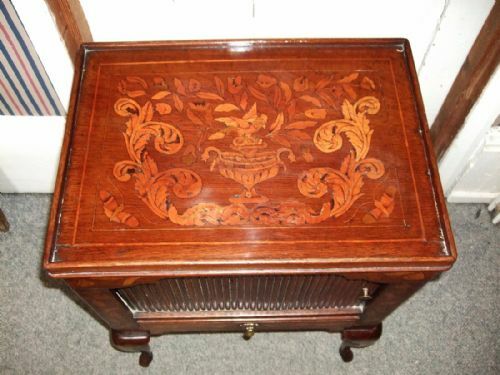 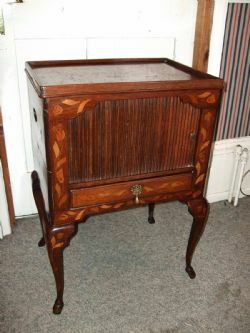 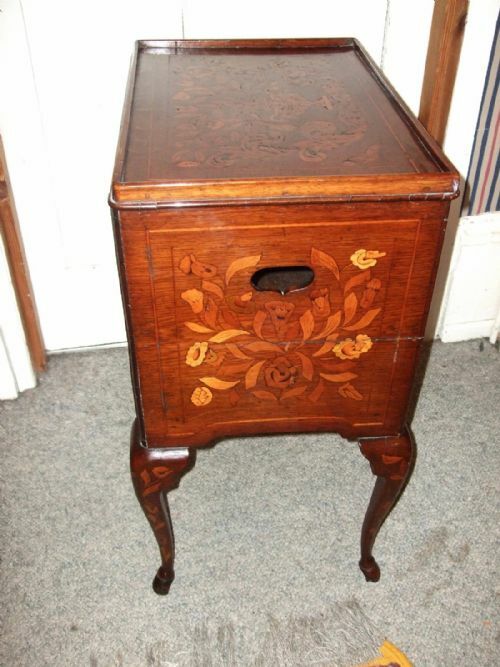 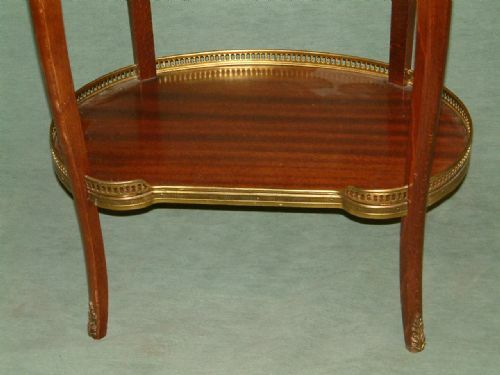 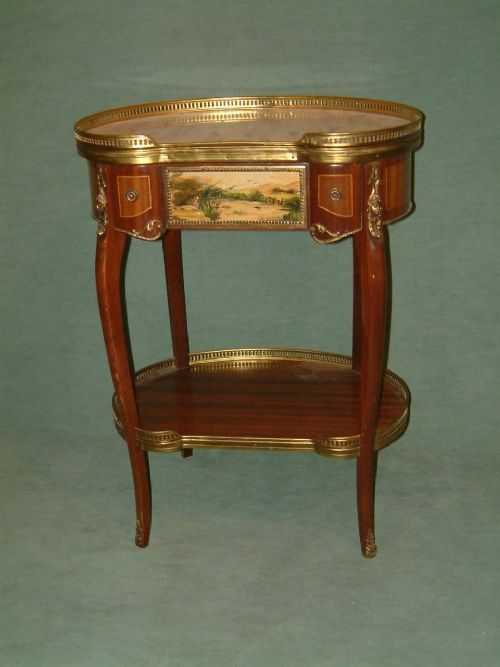 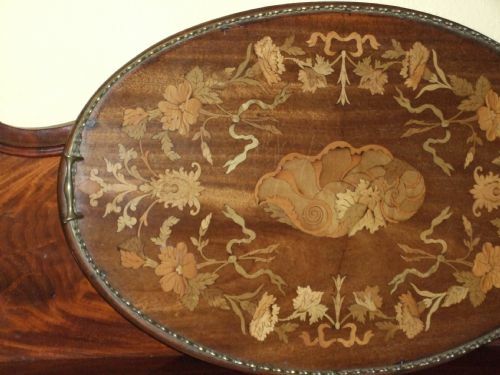 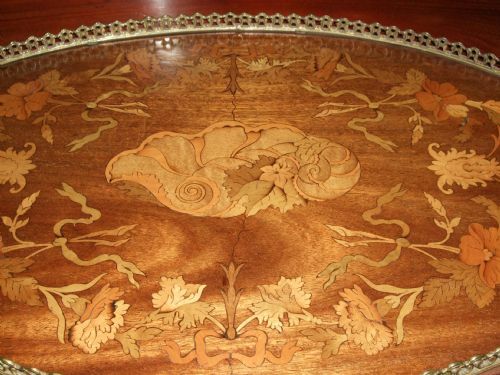 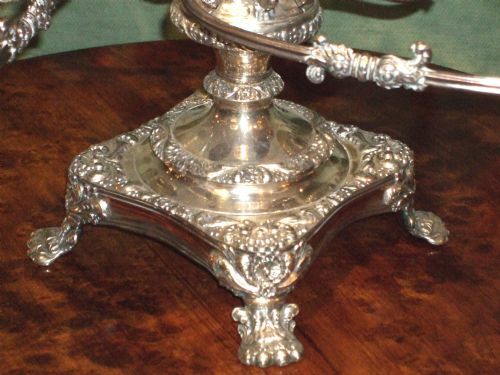 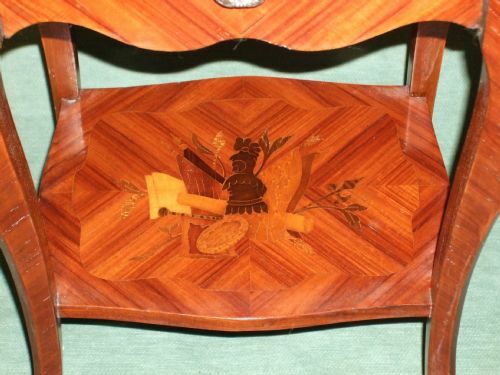 22" Wide 14" Deep 30.5"
Superbly Inlaid with Floral, Animal & Armorial Parquetry Work. 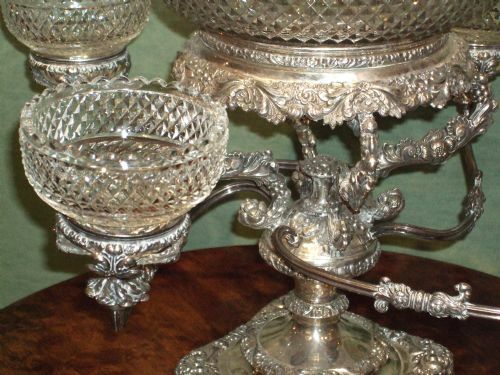 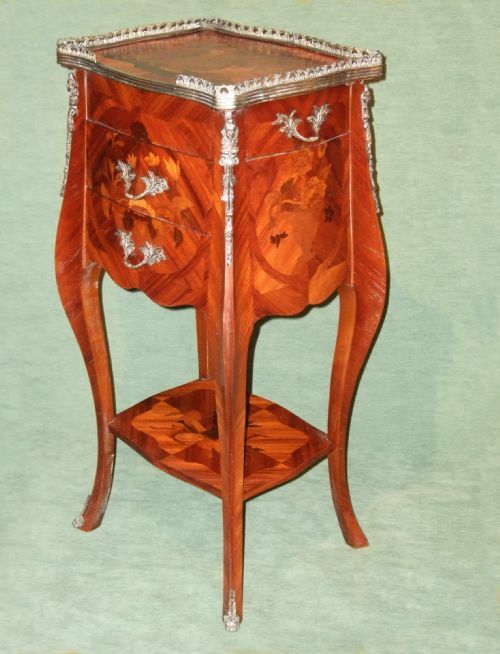 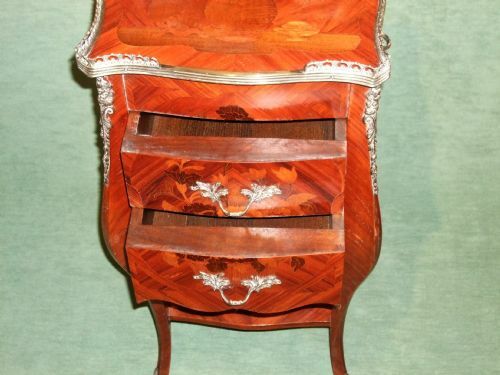 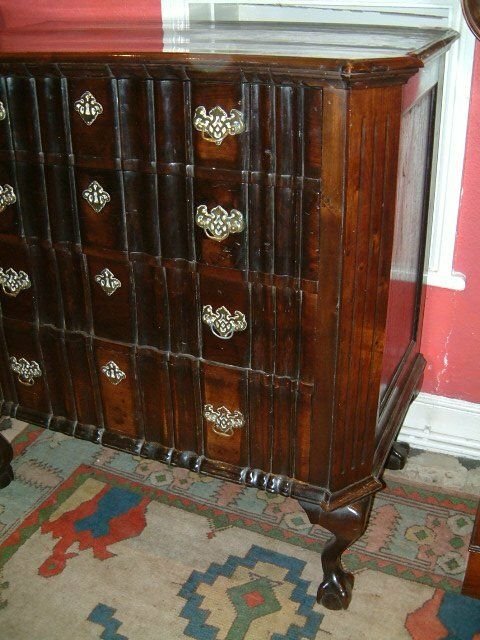 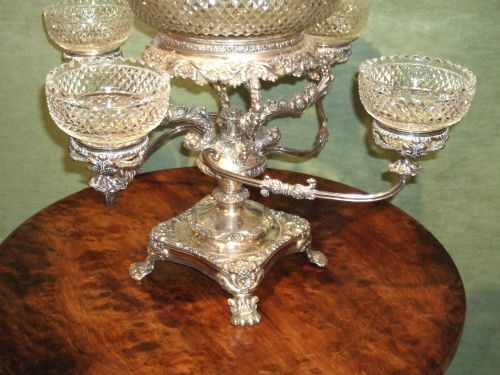 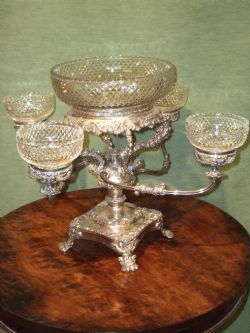 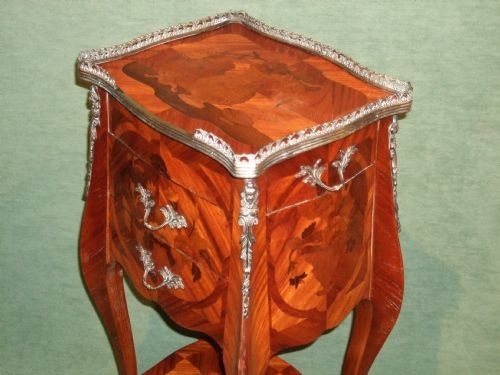 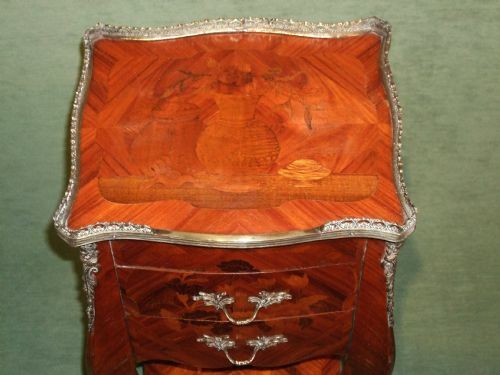 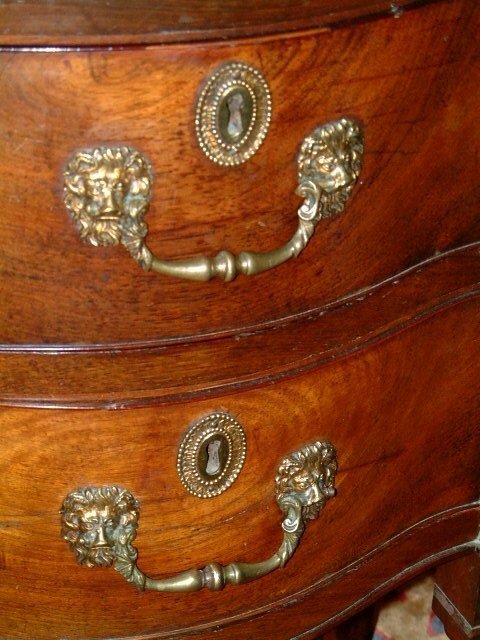 With Ormolu Mounts.Two Drawers to Front One Drawer to Side. 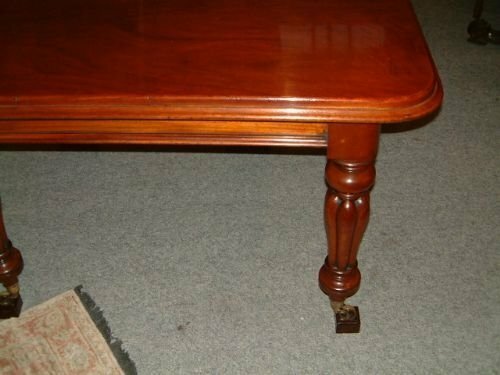 One Sabot to Rear Foot Absent.